Pier Francesco Foschi has remained a relatively unknown Florentine Renaissance artist and his paintings have frequently been attributed to other painters in his circle. From a family of artists, Foschi spent time in Andrea del Sarto’s studio, and his early work reflects that experience. In 1536 he worked with Pontormo on the loggia of the Villa di Careggi, while in 1557 his name is recorded as a member of the guild of Medici e Speziali. Among Foschi’s most important works is the oil of The Virgin and Child with Saints Benedict and Bernard in San Barnaba in Florence, and three paintings for the church of Santo Spirito: The Dispute of the Immaculate Conception, The Resurrection and The Transfiguration. Foschi’s artistic personality and his oeuvre began to be fully established in the mid-1950s when Roberto Longhi devoted the first article to him in 1953. He was followed by Antonio Pinelli in 1967 and by a series of texts that established the artist’s oeuvre in which religious compositions and portraits were particularly important. Foschi’s mature works reveal the influence of Bronzino, Sogliani and Pontormo. The present panel was acquired in July 1935 from the Mercuria gallery in Lucerne as a work by Pontormo. It had previously been in the collection of W. van Dirksen in Berlin, during which time it was lent to the Kaiser-Friedrich Museum in Berlin for an exhibition held in 1906. The next owner was the Paul Bottenwieser Galleries, where it was to be found in 1933. That same year it was included in exhibitions in Detroit and Chicago. 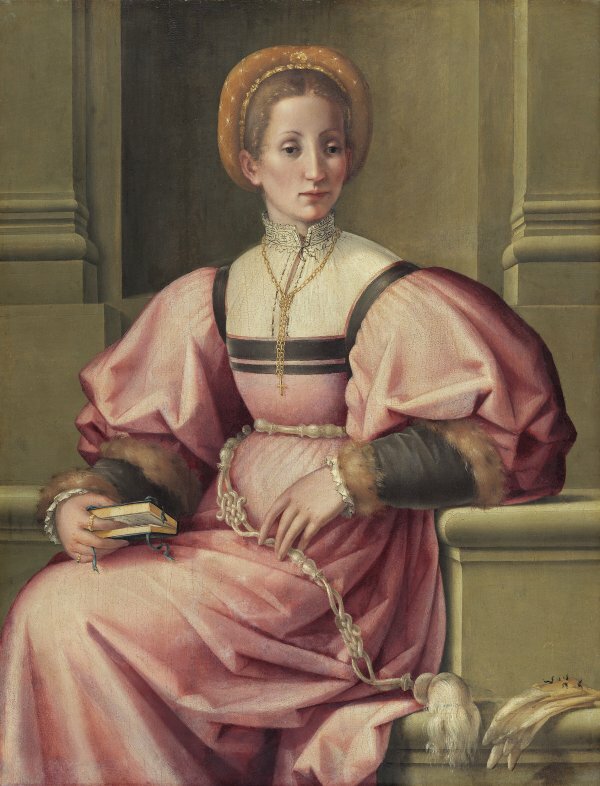 The attribution of this oil on panel to Pontormo was retained in the catalogues of the Collection from 1937 to 1969, and was supported by Berenson, Venturi and Hendy, among others. In 1930 Voss had catalogued it as a work by Foschi, an opinion shared twenty years later by Longhi and Forster. Among the most striking details of this portrait are the background and the pose of the sitter. Foschi depicts a plain architectural setting in which two pilasters emphatically frame the figure of the woman. Seated on a stone ledge, she leans her arms on what seems to be the base of the pilasters. The pose and colour create an extremely elegant figure, combined with the tranquil expression of the face, which is painted with soft, warm flesh tones that define the cheeks and high cheekbones. The figure combines simplicity and luxury, the latter evident in the striking details such as the gloves, the sleeves of the dress, the belt, the fine chain with a cross, the book that she has been reading and the headdress. This panel, which is of extremely high quality, has been compared with the artist’s Portrait of a Lady in the Städelsches Kunstinstitut in Frankfurt.